Traveling can always be an exciting time, whether you're traveling for work, school, or especially vacation! Oftentimes, there are moments when I wish I had a certain object to help me get through the flights more comfortably. That's why I've decided to compile a list of my top 5 travel essentials fit for any carry-on bag! Hopefully this can help you decide what you may need during your own flights and help you pack a bit more efficiently. So, let's get started! A beauty bag is a must! I like to include all my sample sized skin care routine products on top of any other beauty product I might need on a long flight. Whether its a mist or a sleeping pack... it's important to hydrate your skin while traveling because the air can oftentimes be very dry on an airplane. I know you may be thinking... "is this really necessary?" But yes, it is! I know each one of you love to take your shoes off for those long flights (4 hours +) and these slippers will come in handy in flight AND at the hotel. Why? Well because 1) hotels do not provide toothpaste and 2) there will be a point on your flight when your mouth feels icky, dry, and just plain foul. A toothbrush and toothpaste are lightweight enough to be carried on your carry-on bag and they come in handy when you just really want to brush your teeth during and after a long flight! On my recent business trip to SF, I found myself freezing on the flight back home! I even asked for a blanket but the blanket was so thin... it didn't really help. So I've realized that having a scarf that can also double as a blanket would be so helpful for these cold flights. 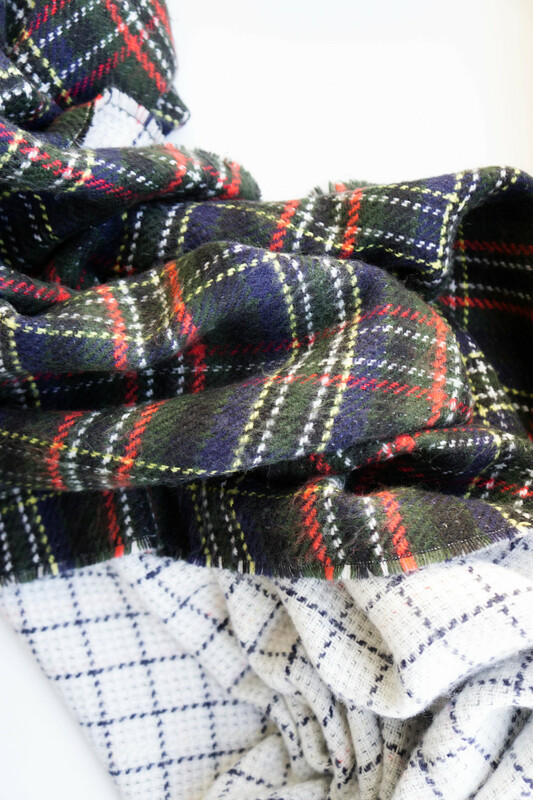 The beauty of having a scarf that also works as a blanket is that you can use it as an accessory when you don't want to carry it in your bag. You never know when you'll encounter a chilly night wherever you go! I've forgotten a charger way too many times on trips, that I finally decided to just have an electronics bag that carries all chargers I need, whether it's for my phone or camera, in one. I include my earphones in as well, so that when I go to look for any kind of electronic wires, I know it'll all be in this bag! You can just use any dust bag you have lying around! Here, I used an old White Barn candle bag which works perfectly. For all you beauty junkies out there... this last essential will be your skin saver. ;) As I mentioned above, the airplane air can be very dry and not good for your skin. I recommend bringing a sheet mask or two on the flight to just relax, kick back, and mask on! When you wake up, your skin will be glowing and it'll definitely thank you! There we have it! My top 5 travel essentials for my carry-on bag. Of course, all of these suggestions are just what I've gathered from my own experiences, so you can choose to try one or all of these ideas. Keep an eye out for My Top 5 Travel Essentials: Check-In Bag Edition but until then... bon voyage! This past weekend I had the joy and privilege of decorating my sis-in-law's baby shower! With the help of another one of her friends, we were in charge of decorations and were able to throw a whimsical yet beautiful shower. The room was filled with decorations that are easy to create and execute! At first, when I saw the space we would be having the baby shower at, I was so sad I wouldn't be able to decorate a space full of white walls and natural light. There were no windows, the lighting was dim, and it was a HUGE space. Big spaces are much harder to decorate because there's just so much surface space to decorate and leaves a lot of space for the room to feel bare. With a budget, I did the best I could with the space and it turned out to be even better than I had imagined. I could go on and on about the thought process behind what decorations to use and why... so let's get started! 1.) Use as many BALLOONS as you can. Balloons have always been my best friend when it comes to decorating a party or a huge space for an event. Ideally, you'd want to have tons and tons of helium filled white balloons so your room can look absolutely ethereal and amazing, right? Sadly, the reality is we all don't have the money to get all those helium filled balloons. Instead, carve some time out the night before and blow up as many balloons as you can! Tie a long piece of ribbon at the end and you can use tape to hang them upside down... they're still really pretty this way! With that being said, there are so many different ways you can hang balloons and utilize them as decorations. With the help of my gracious brother (thank you!) I was able to hang balloons upside down (pictured above) and also display them on tables so it added a bit of color and fun to the room. 2.) Use more WHITE FLOWERS and add some COLORED FLOWERS accordingly. I absolutely adore flowers. Any type of flowers and floral arrangements make me SO happy. Flowers can add so much whimsy and elegance to any space and event. But I know flowers can also get very expensive. I love to use baby's breath, if you haven't noticed from past posts, to decorate any space because those are especially whimsical, dainty, cheap, and white. Since white goes with any color scheme I like to just buy a bouquet of colored flowers and a lot of baby's breath and hydrangeas (if your budget permits). Use clear jars, vases, or mason jars to hold your floral arrangements! 3.) Use tissue paper for DIY POM POMS and TASSLE BANNERS. After helping decorate this baby shower, I've become a true fan of tissue paper pom poms. They are so pretty when you hang them or even just stick them on the wall. They add such a nice touch and guess what... they're really cost-efficient as well! You can either DIY by gathering around 12 sheets, folding it accordion style, tying it in the middle and then spreading the sheets out. If you don't want to completely DIY, at Michaels they were selling a box of 6 for $10! They're a bit tedious to make, but totally worth it! You can also make tassle banners with tissue paper. All you need is string, tissue paper, scissors, and pretty tape. Here's an easy tutorial on how to! 4.) Add some EDIBLE DECORATIONS. Whether its for a baby shower or a birthday party, adding some edible decorations always adds a bit of cute and fun into the event. Plus they're yummy. ;) Cupcakes or cake pops are usually nice to display as decorations, but those are super time consuming to make, as well as expensive! A cheaper alternative I tried for this baby shower, was chocolate dipped marshmallows. You can buy any color candy melt from a Michaels store, melt it, and then just dip your marshmallow sticks in them. You can buy the sticks at Michaels as well and just prop the marshmallow on some parchment paper. 5.) Concentrate on a WALL (and TABLE) to decorate for photo taking. This last tip is especially nice for baby showers. Having a table with the cake, party favors, desserts, and pictures is a great place to stand behind for pictures. If there's a wall behind that table, make sure to leave a little space so that the star of the party can stand behind the table, and in front of the wall to take pictures at! With this blank wall, make sure to concentrate on putting up a pretty floral or worded banner, balloons, and pom poms. These decorations will help fill in the blank space and make for a great backdrop for photos! I found that using clear packing tape to hang these decorations was easiest... both while putting up and taking down. Of course there are many different ways to decorate baby shower's, I found that focusing in on 3-4 decorations was easiest for me to handle. For this one, I concentrated mostly on balloons, pom poms, and flowers. Since it was a dim lit room, I went with that ambiance and added in some candles which really helped in giving it a romantic feel. Whichever way you decide to decorate your event... just make sure to have a vision of how you'd like the space to look after and have fun! Au revoir for now! Only 10 more days until Christmas! My favorite holiday... not only because of the beautiful lights, festive decorations, and cheerful spirits but because it's the day Jesus was born! In light of this holiday season I thought it be fun to show you a little DIY Christmas gift fit for any of your friends and family. It's extremely easy to make and best of all you can customize it however way you'd like. I got this inspiration from the Kate Spade notebooks but when going to purchase, they were so expensive! This is a great alternative and a great gift for anyone. I also know not everyone has amazing hand-lettering writing so stencils are an easy and nice way to design notebooks. Let's get started! Place the stencil above the notebook. If you're a perfectionist you can pencil in two parallel lines as a guide and color the letters in between those lines. Start coloring inside the stencil. Since most stencils are thin letters, I do recommend using a fine tip marker so you can really get inside the stencil and color in all corners. Don't be afraid to simply write or draw one thing on the notebook. I love simple designs and I'm obsessed with ampersands so this is also a great design to put on a notebook. And VOILA we're done! Don't you just love this season of giving and gifting? Hope you enjoy it all during the process and happy gifting! Hi! It's been a while, hasn't it?! It was so hectic with all these events going on at work, but I'm back here with a post I've been meaning to share for a while now. It's on... how to get organized! Now, this isn't a post to show you that I'm the MOST organized or neat person out there, but here are a few tips that have helped me keep myself and my life in check. I can get clumsy and forgetful at times so some of these tips have helped me to organize myself a bit better. I know we can all get swamped with school, work, and family so sit back, relax, and enjoy some few tips I have for you. 1.) CLEAN YOUR SPACE WHETHER IT'S YOUR DESK, SHELVES, OR APARTMENT/HOME AS A WHOLE. This tip might seem like an obvious step in how to get organized but you'd be surprised at how many times we overlook this one step! It's not a simple one... cleaning is never an easy task! But it does help if you even tidy about the space around you and THROW AWAY ANY TRASH OR OLD ITEMS. There is no other feeling than satisfaction when throwing away or donating any unused items/trash. 2.) CLEAN/ORGANIZE YOUR COMPUTER AND FILES (INTERNALLY). I know how easy it is to just save our files anywhere on our laptops but just take a moment to create new folders and drop your files/photos accordingly. Start with a pleasant desktop photo and start making your way through your documents, photos and desktop files. After starting a blog, I have so many edited photos I just save on to my desktop because its fast and convenient to locate. But I have to always take a moment and reorganize my laptop so that I don't take up any excess storage space and so that my laptop is internally organized! Don't forget to close all your tabs and shut down your laptops for some time. I know us Mac users can get used to how quick our laptops sleep and wake up, but let it rest a little bit (completely shut down) and restart it! 3.) GET POUCHES FOR... EVERYTHING TO CARRY IN YOUR BAG. I cannot tell you enough how convenient it is to get pouches and small bags for everything! Whether its for your pencils/pens, beauty items, or electronics... get small pouches and organize accordingly. Even you men out there! I have a small makeup bag I always carry around with the essentials (chapstick, mascara, some concealer), another separate pouch for my pens/pencils and then another one for my electronics (iphone charger, earbuds) and miscellaneous items like gum. You can find some cheap and cute ones like these or if you type in "small pouches" into Amazon you can find simpler designed ones for you men out there! 4.) GET A DAILY PLANNER AND NOTEBOOK YOU WILL ACTUALLY CARRY AROUND AND USE. I know some of you may not think you need a planner especially in this day and age when we have google calendar and our phones. However, I can't stress enough how helpful it is to actually write down your schedule so that even if you happen to not bring your planner out, you will remember the events of the day! It also helps that you can go back to a hardcopy and see what you have planned for the rest of the week. Same thing goes with a notebook. I carry a thin, lightweight notebook around EVERYWHERE, so I can jot down my ideas and notes! It has been so helpful and I urge you all to purchase a planner and notebook that is LIGHT ENOUGH for you to want to carry around. If it's bulky and heavy, we're not going to want to lug it around anywhere. 5.) CLEAN OUT/ORGANIZE YOUR BAG AND WALLET. This is another step that usually goes unforgotten. But our bags (backpacks, handbags) and wallets get so messy from the chaos of our daily lives! Whether its receipts we don't need anymore, or papers/notes that we can toss out... it's crucial to, again take a moment and clean out your bags and wallets. I like to throw away any receipts I know that have been processed on my card already or items that I know I won't return. If there are any receipts I need to keep, I have a small section in my wallet to store those receipts so that later on it's easier to find. I can be quite forgetful so it's helpful for me to know that I have a separate section for these things. This is when the pouches come in handy for your bags! After cleaning out your bags you can put all miscellaneous items in a pouch so you don't have to dig for these things. 6.) GET SMALL DRAWERS, BINS, MASON JARS, AND TRAYS FOR STORAGE AROUND YOUR ROOM. If you haven't noticed already by now... I am a huge fan of storing everything in one place whether it's a small plastic drawer or a small mason jar. This helps your room to simply look more organized and will definitely help in when you need to find/locate things! Even if you have a myriad of miscellaneous items just laying around and can't seem to categorize the items, get a medium sized bin and at least store them in there and mark it "Miscellaneous" or "Other Items". This is much better than having all these things just laying around randomly... you'll never get around to using! I also use trays to display and store my beauty products such as perfumes and creams. This "Acrylic Storage" series from MUJI is an awesome option! I use the small one for makeup products I use at home and for my jewelry I wear frequently. There we have it! Here are only 6 ways out of many many ways to get organized. A key thing to remember is that, the less items you have laying around your room.... the easier your life will get when needing to find these things. Also always remembering to clean out important items of your life, such as room, notebooks, and wallets will help you to feel more organized. Have a clean and organized weekend and enjoy! I adore mason jars. Even more than that, I love decorating mason jars because there is just so much you can do with them. Today, I'll be showing you 5 simple ways to decorate a mason jar whether its for a party centerpiece, wedding centerpiece, pencil holder, kitchen supply holder, or for anything else. 1.) Use delicate flowers, leaves, and twine to decorate. Using delicate pieces to decorate your mason jar can help in providing a natural, organic vibe. I used some leaves here to intertwine them with some twine I had and also used the twine to hold the baby's breathe in place. This is so beautiful to even just use as is, without any flowers in the jar! 2.) Use feathers, leaves (optional), and ribbon to decorate the rim. As much as I love decorating the middle of the mason jar, I also love to give some attention to the rim area. Here, I've tied a lovely pink ribbon into a bow at the rim. Then I easily slipped in the feather and leaf in the center, to secure both in place. It was so easy and I absolutely love the whimsy feel the feather gives to this decor. 3.) Use twine as the main attraction of the jar and fill it with rice and beans for an organic feel. Here I've used twine as my main source of decoration for the outside of the jar. I just held the twine in place the first time around, and then kept wrapping it around and around the jar until I had my desired amount. With the other end of the twine, I then tied a little bow. After, I filled the jar with beans and colorful rice. I made a pattern in the inside, by first filling it with beans, then a bit of rice, and then some more beans on top. This makes for a perfect way to stand flowers up, or put your makeup brushes and pens in! This would also be perfect to use for a rustic, barn wedding. 4.) Use lemon and orange slices to decorate the inside of a jar. The colors of of oranges and lemons make me so happy! They're bright, color, and are perfect to use to add color to any mason jar. First, cut the ends of the lemons and put those ends in the center. These will help your slices be held up on the sides. After, slice the slices 1/4 thick and place them accordingliy around the jar. The more ends you stack up in the center, the more it well help in holding the slices up. I added some orange slices as well to add more color. They smell lovely too! 5.) Use spray paint and tape to color and make different patterns for your mason jar. If you've seen some of my DIY stuff here, you know by now... how much I love using spray paint, especially in gold. I love the color gold and I think for any party, it adds a touch of elegance and glamour. For a more glamorous look, I've spray painted the bottom half of my mason jar with this gold spray paint and filled it with fake diamond gems. You can find the gems at T.J. Maxx or even Michaels. I used scotch tape to make the design on the jar and just painted the bottom part of where I taped it off. It made a cool traingular shape... and I loved the natural look of the spray paint. It's not a perfect paint job, but I'm such a huge fan of the natural vibe it gave off! And there you have it! 5 simple ways to decorate a mason jar for any occasion and for any purpose! I use mason jars to put my makeup brushes in, my pencils, and so many other things! I've used it to put flowers in... and I just love how versatile the mason jar is whether you're decorating it or just using it around the home. There are SO many more ways to decorate but I hope this inspires everyone a little to use whatever they have around to simply make something ordinary... into something extraordinary! Enjoy! Summers a perfect time to have small get-togethers and little parties outdoors. And what better way than to host a garden party for all your friends! Today, I'll give you some tips on how to decorate your party including centerpieces, cost- efficiently and in a delightfully chic way. All by using resources from your backyard and from things around the home. Everything I used today for my garden party was from my own home and yard, with the exception of the baby's breath flowers and balloons I bought. Hope this inspires you all to have outdoor parties or even plan DIY weddings outdoors! 1.) Use picture frames from your home. Using picture frames from around my house is one of my favorites ways to decorate a centerpiece of a table for a party. I decided to go with a pink, white, and gold theme for my garden party today. I was able to find some picture frames that fit my color scheme. Now, you may be thinking what you should put in these frames but you can easily create your own signs or paintings! These only took me 15 minutes to make and they were so cute and appropriate for this garden party. Frames always add a nice touch to any centerpiece and gives the table a nice homey feel to it. 2.) Use leaves and branches from your trees and spray paint them. I've always loved big and extravagant centerpieces. But I also know how expensive huge, floral centerpieces can get. So I decided to use some big leaves that were attached to thin branches and put them in some mason jars. Since I had some gold spray paint as well, I just lightly spray painted them... and they came out looking so beautiful! You can completely cover your leaves with your color of choice, but I wanted some green as well so I just sporatically painted them. 3.) Use baby's breathe flowers for cost- efficiency and for a whimsical look. I never use to see the beauty in baby's breathe flowers until recently and now I'm absolutely in love with them. Especially, when they're used as the main flowers, they give such a whimsy and delicate look to any decoration. I paired these flowers with gold dipped leaves and they turned out to be such a magical pairing. Since baby's breathe flowers are white in color, they go with any color scheme and other floral arrangements. They're also so cheap! These were just $3 for a handful. I was able to put these flowers in all differently decorated jars around the table and they added a lovely touch to my table. 4.) Tie balloons around tree trunks with twine. I absolutely adore balloons... for all occasions. Sometimes getting helium balloons at your party can be a hassle or expensive. I bought two bags of balloons for just $2 each, blew them up myself, and tied them around my tree trunks. I tied them with twine to give it a more rustic look and it worked perfectly! You can also hang balloons from branches as decorations and they look great when the wind blows. Lets say however, you're hosting a party indoors. You can still hang balloons from the ceiling with some twine and tape! Balloons are just a fun way to add color to any festivity you're hosting. 5.) 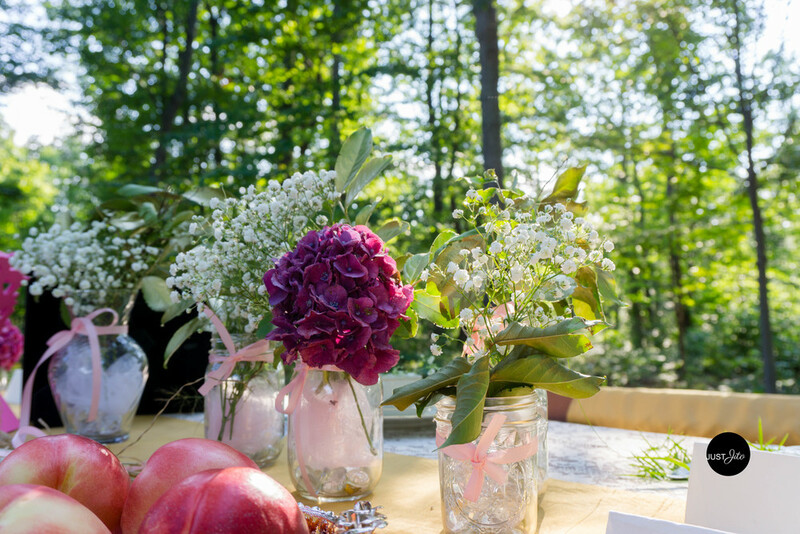 Use any clear vases, mason jars, bowls or cups you have for your centerpieces. If you don't want to splurge on expensive glass vases for your floral arrangements, no worries. Nowadays, mason jars are always used at parties to give it a more fun and rustic look. But not only do mason jars work, essentially any clear bowl or cup works as a vase as well. I was able to gather some clear jars and bowls to diversify my decorations. If you want to keep everything cohesive, you can choose to decorate with JUST mason jars or JUST bowls. I love to use clear ones when I'm decorating with colorful flowers so the flowers really stand out. 6.) Decorate & fill the jars. Now with the jars and bowls you use for your flowers, don't forget to decorate them with ribbon and some twine. That's all you need. Even just ribbon and twine makes a huge difference. Also, I had some clear pebbles as decoration around the home, so I used those to fill some of my bowls up. You can essentially use anything from pieces of tulle, tissue paper, rice, stones and even flower petals! They all make for a great filler in these clear jars. 7.) Create and make your own name cards. Even if its for a small gathering, name cards are a great way to show special attention to each person. It also adds a nice touch to the table. They're so easy to make and your own handwriting has a nice homemade feel to it. I just used some thick paper and folded it in half to make the cards stand. Then, I used some watered down gouache paint (tutorial here) and then my calligraphy writing (tutorial here) for a beautiful name card. 8.) Place flowers on top of table dishes/placements. Placing flowers or leaves on top of table place settings adds a sweet touch to the decor of the party. For me, it's always a delight to come sit at my place at a dinner table and have a simple flower waiting for me. Not only does it add a nice touch, but your guests can take it home afterwards! I used some hand picked hydrangeas and leftover baby's breathe to add some extra sweetness to my dish settings. 9.) Use fruits as table decoration to eat or as a party favor. Here I used peaches as decoration for the table as well as for party favors for the guests to take home after. Peaches are a great summer fruit that add a beatiful and colorful decor to any outdoor party. You can use other fruits such as strawberries, cheeries, pears, and much more for decoration AND to eat. You can place the fruits on pretty platters or you can just simply place them around your jars as decoration. I suggest doing that with fruits like apples, pears, and peaches (ones with tough skins!) so your guests can just wash them when they get home and eat them. Lastly, just enjoy this lovely party you've planned and decorated! Whether its a whimsical garden party or a hipster barbeque party... there are so many cost-efficient ways to decorate an outdoor space! Use as much nature (hand picked flowers, leaves, wood, etc.) and creativity as you can. The great thing about the outdoors is that you automatically have a beautiful scenery AND all these decorations can also be used for indoor parties. Now go plan away and enjoy! Okay, so what even is gouache paint?! I'll get to that in a bit below, but let me explain why I'm even bringing this up! Now, let me just say I am no professional artist so everything I write about are all my personal thoughts! I've been taking a design class here back at home and we recently had a "Color Focus" project we had to do. The objective of this project was to create a monochromatic diptych using any paint we wanted. I wanted to draw a haute couture illustration... it's my favorite thing to draw probably because I absolutely adore it! So, I decided to try out gouache paint for the first time! But what is gouache paint? Gouache paint is like an opaque watercolor. So, while you are able to see the whites of the paper (transparent) when you use watercolor, gouache is like solid paint (opaque). The great thing about gouache is that even though it is more pigmented than watercolor, if you add a good amount of water while painting you can get an affect similar to that of watercolor! It was so great to use! You get the best of both affects of watercolor and something thicker like, acrylic. So if any of you decide you want to make handmade cards (of course, on thick paper) you should definitely look into using gouache. Depending on how much water you add while using the paint, you can get a variety of different intensities in color! For a smoother line, I recommend adding a bit of water which will greatly help you to achieve a matte, smooth look. With gouache, I found it to be a lot easier to layer and create different shadows within one color. You can simply add some white here and there, and if it gets a bit too much... just add some water and smooth everything out. Also, the paint dries within 5-10 minutes so layering the paint was easy to do! I used the brand Reeves for my gouache paint, but if you go to Michaels or any art supply store, there's a huge variety of gouache paint to choose from! As for paper, I chose a watercolor paper pad that was 145 lbs. You need to paint on thick paper so that it can handle all the layers of paint! I definitely recommend you to try out gouache paint if you're looking to paint something or simply hand make a card... enjoy! I've always loved to write cards and decorate any blank space I have with letters/writings. A few years ago, I completely fell in love with the calligraphy like fonts that had been trending. It's so whimsy and lovely! Makes me feel all happy inside when I see beautiful calligraphy. But I never got myself to go out and buy a traditionally calligraphy pen until recently. So, I had learned to create a fake calligraphy technique that has worked well all these years. I even wrote the name/addresses for my brother and sister in law's wedding invitation envelopes using this technique! So today I thought I'd share it with you all! First, you'll need to use a nice fine tip ink pen. Micron is nice but I've always loved using this Pilot ink pen you can find just about anywhere. Next, with pencil, write whatever you want to write. I always use pencil first so I can achieve my ideal handwriting and still use an eraser if needed! But, you can freehand as well. Then, go over the pencil writing with your ink pen. To make it look like the calligraphy font, you're going to want to create this variation in thickness by drawing a line next to the longest stroke of each letter and filling it in. So all of the down strokes should be thicker and filled in, as if you've been using an angled calligraphy pen. See! Wasn't it easy and hassle free? Here I've created a couple of different fonts over the past few years as I've experienced with this technique. It's so easy! Now you can easily achieve calligraphy writing without a traditional pen! Enjoy! Do any of you guys have old nail polish that you're just waiting to toss out or don't use anymore?! Well, here's a DIY crafts for you! You can buy a cheap, wooden or white picture frame from any dollar store (mine was from IKEA) and use old nail polish to revamp it! Summer means bright colors! So this DIY is an easy, no fuss paint job. 1.) Tape your picture frame in the design you want. For me, I wanted to do slanted stripes so I placed my tape accordingly. You're using the tape as basically a stencil. 2.) Next, paint the areas that have not been taped. It's okay if you paint over the tape because once you take the tape off, the line will be perfectly straight. 3.) Wait a couple of minutes and paint another coat. 4.) Wait until everything is dry and then peel the tape of slowly and carefully. 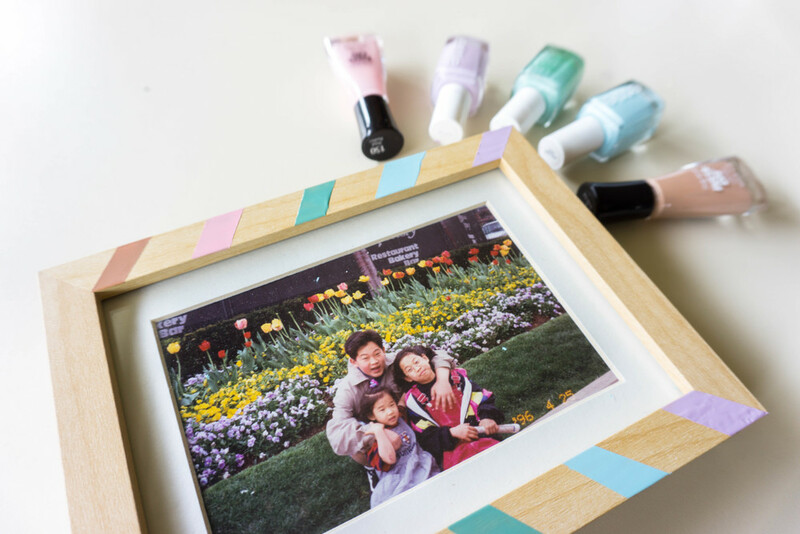 I had so much fun making this and the nail polish looks fun and cool on the frame! You can gift this or just simply do this to redecorate! How cute does it look on a shelf or anywhere around your room? Enjoy!